In Music We Trust - Masticators, The: Masticate! Whatever happened to pop that was bouncy, fun, and enjoyable, didn't take itself too seriously, but wasn't all tongue-in-cheek joke after joke, either? 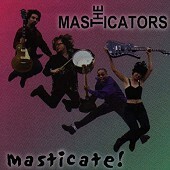 Well, The Masticators seem to be one of the few bands as-of-late worthy of being honored with the title of good "pop" music. The songs make you tingle, get you singing along, and aren't afraid to say something either, without forcing it down your throat. "Now That You're Gone" burns with passion and fire, driving the pop to a boil as it burns you and makes you want to move, while "Radio Police" is the indie pop band anthem for the new millennium, as much about the message as it is about the strong hooks and quirky riffs throughout. "He's A Boy" shows their sweet side as they focus on sweet pop rather than charged rock, and the "Kidnapper Song" will have you bouncing off walls with its chunky punk and wave-y surf grooves. Pop music isn't dead, and neither is rock music. A testament to both these claims is good solid power-pop from The Masticators, a band sure to never get their dues, but to blow away those that are lucky (and smart) enough to catch wind of them. I'll give it an A-.